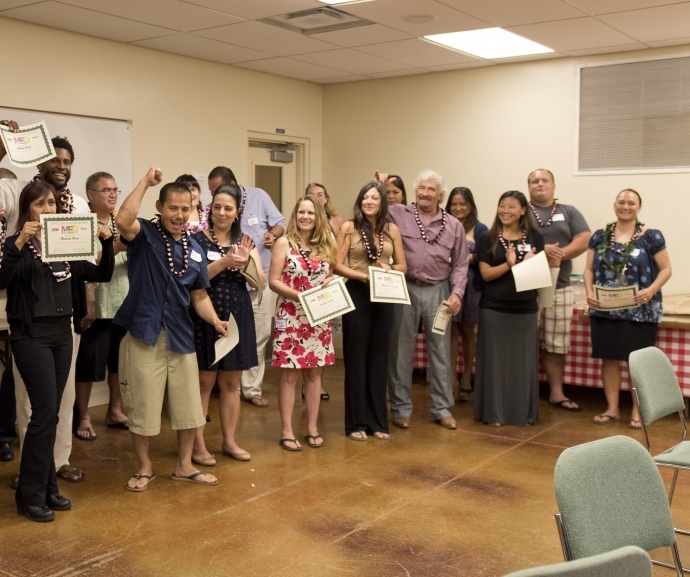 More than 80 people participated in last weekend’s empowering event for entrepreneurs, including members of Startup Weekend Maui’s 2015 alumni plus the coaches, mentors, judges and the Maui Economic Development Board staff. Photo by: Casey Nishikawa. 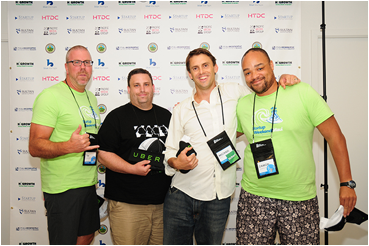 Participants from this year’s Startup Weekend Maui held over the weekend, May 15 to 17, proved it is possible to create a start-up business in just 54 hours. 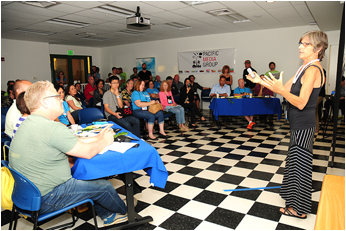 Almost 80 residents and visitors participated in this event for entrepreneurs presented by Maui Economic Development Board and held at its Malcolm Center and the Maui Research & Technology Center in Kīhei. After the event kicked off with 60-second open-mic pitches, teams formed around the top-voted startup ideas and worked through the weekend with mentors and coaches to build viable prototypes, which they presented to a panel of judges on Sunday night. 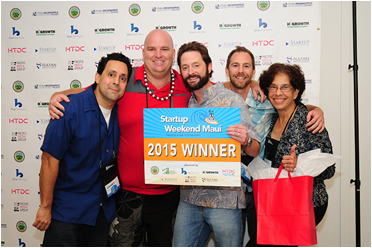 The team of Board.vote captured first place at the 2015 Startup Weekend Maui. Their startup offers a team voting solution for nonprofit leaders. Pictured from left are Danny Macias, Philip Heath, David Fry, Craig Wheeler and Tahi Reynolds. Photo by Casey Nishikawa. Board.Vote, an idea pitched by StartUp Weekend Maui return return contestant David Fry, captured first place for a Web app business he calls “Board.Vote.” The application would allow various nonprofit boards (home owners associations, for example) to vote on important issues remotely, saving time and effort in the voting process. The Board.Vote team will receive a prize package valued at more than $3,400. It includes two passes to Maui Economic Opportunity’s Core 4 Business Planning workshop, a Maui Chamber of Commerce one-year membership, a one-day rental of MEDB’s Malcolm Center, two hours of branding advice from Sae Design, a two-hour digital branding consultation by The Accidental Consultant, design and printing of a rack card or business card by Linn Nishikawa & Associates and Maui Printing Company, two hours of legal advice by McKeon Sheldon Mehling and two passes to MEDB’s business assistance workshops for a year. The teams of “ticker!” led by Michael Ross, an entrepreneur and full-time bartender, and Waikapū Pickles conceived by close friends Tammy Evangelista-McGuire and Elizabeth Smith captured second and third place, respectively. ticker! also won the audience vote. The team of “ticker!” captured second place overall along with the audience’s popular vote. Their start-up offers a social game for the stock market. Pictured left to right: Tim Christensen, Dwain Bethel, Michael Ross and Damon Garrison. Courtesy photo. ticker!, is an on line game that allows players to compete against each other in a realistic stock market. Waikapu Pickles, plans on producing locally grown and fermented cucumber pickles to satisfy the local pickle market. McGuire and Smith said the idea of opening a business featuring fresh, local and affordable pickles arose in a conversation just two weeks ago. 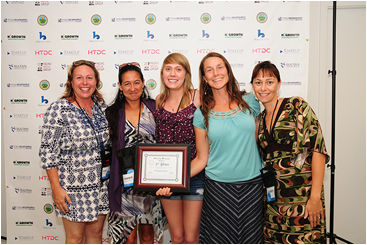 Third place winner, the team of Waikapu Pickles, plan on bringing “Pickles for the People!” Pictured from left are Kim Scott, Tammie Evangelista-Mcguire, Victoria Alexa Scott, Jen Fordyce, and Elizabeth Smith. Photo by: Casey Nishikawa. Paula Satterthwaite, a retiring South Maui teacher with property in Hāna, said she was confident that she would move forward with her idea to create a centralized place for local artists and commercial vendors to sell their wares in remote East Maui. Retiring teacher Paula Satterthwaite presented her idea in front of this year’s judges. 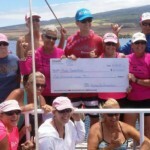 Her startup, Hana O Hana, offers a local outdoor market for visitors in Hana. 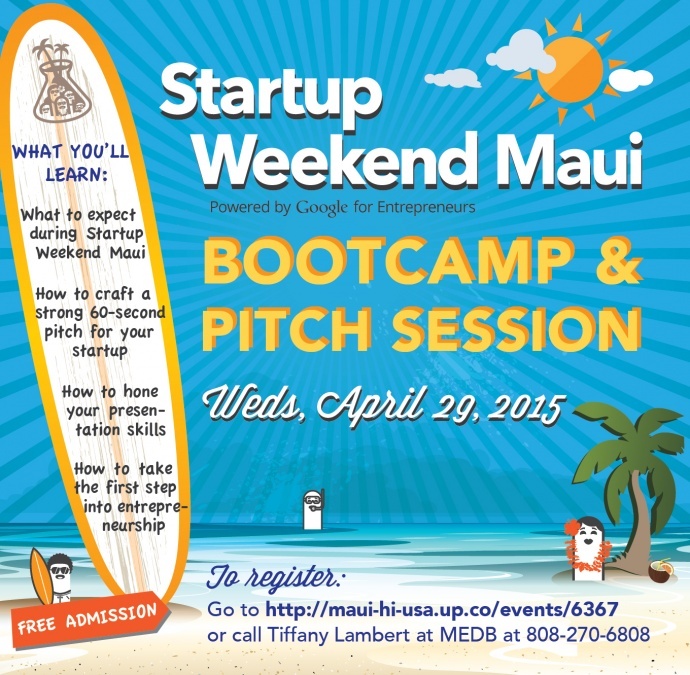 Paula received a scholarship from MEDB to attend Startup Weekend Maui. Photo by: Casey Nishikawa. Saedene Ota, the owner of Sae Design and one of the weekend’s judges, commended Sattethwaite for her business idea. She suggested Sattethwaite reconsider creating a nonprofit and perhaps apply for a county grant. “Obviously you’re doing this from the heart,” Ota told Satterthwaite, adding that she and a few judges were willing to contribute to start-up expenses. While anthropologist Zoe Weston’s business pitch did not make the weekend cut, she shared that she gained many lessons in helping another aspiring entrepreneur test and shape his business idea. “No matter what, you’re going to learn about how to run your business by participating in this process,” Weston said. Prior to Sunday night’s announcement of the winners, Waikapu Pickles’ McGuire said the weekend exceeded her expectations. “Please keep doing this,” Christopher Taylor told MEDB President and CEO Jeanne Skog during an informal feedback session. Like Weston, Taylor set his business pitch aside and helped another would-be entrepreneur test and explore a business idea. “You learn that so much happens organically,” Taylor said, adding that he learned in marketing research, businesses have to adapt based on customer wants and needs. Participants expressed feelings of exhaustion and exhilaration after the 54-hour experience with a few hours of sleep. “Remember the feeling you have right now and use that for tomorrow, and the next day, and the next day,” Butteling said. Startup Weekend Judge Don Kosak, the Nalukai Foundation founder/managing partner, encouraged participants to keep in touch even after the event. “If you get stuck, don’t be afraid to reach out for assistance,” said Tarik Sultan of Sultan Ventures. “If this is your passion, pursue it,” said Ota. “It may sound rough but you have to experience failure. 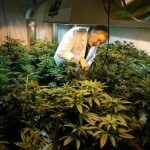 … If you fall down, get back up,” said Garrett Marrero, founder/CEO of Maui Brewing Company. MEDB would like to thank the participants, sponsors, judges, coaches, mentors and event facilitator.